Photos by Joel White (left) and Sara Wickham. This perennial brown algae has a single thick blade attached to a long rigid upright stipe. It is a medium to dark brown colour. The blade and the stipe each reach up to 80 cm long. The blade is long and flat, and split into fairly even segments almost to its base. 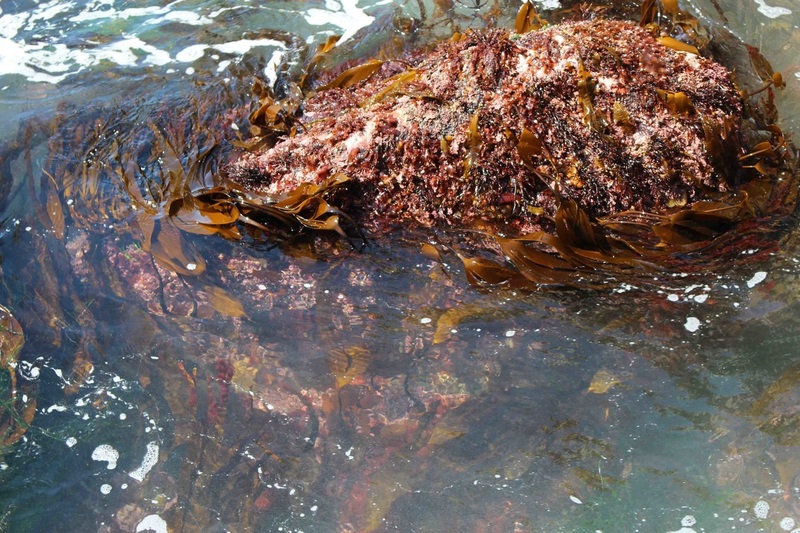 Southern stiff-stiped kelp has a hapteroid (branched) holdfast. 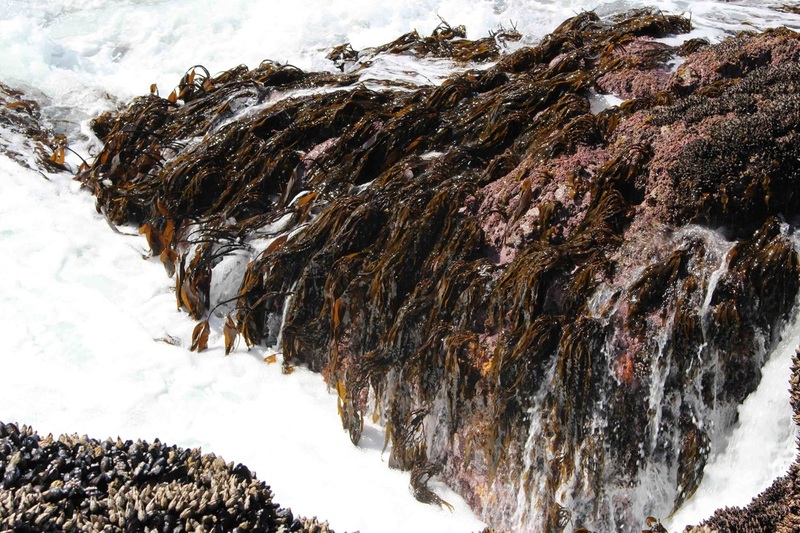 Southern stiff-stiped kelp grows on rock in the deep intertidal and subtidal of exposed shorelines. It usually forms bands or extensive patches in suitable locations. Its range extends from the eastern Gulf of Alaska to Baja California. Northern stiff-stiped kelp (Saccharina dentigera), which also has a stiff stipe and a single segmented blade, is not found south of Alaska. Split kelp (Saccharina groenlandica) has a single blade split into two or three, though these segments aren't necessarily even. 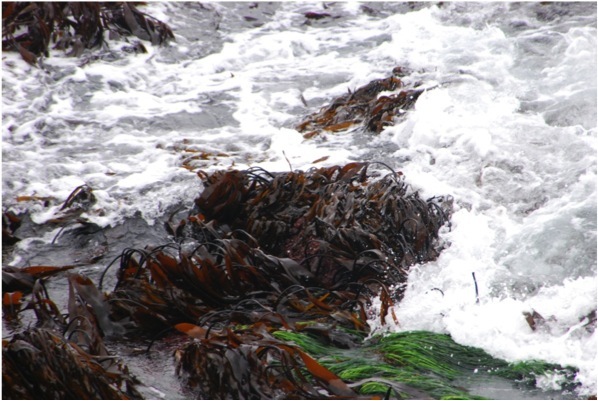 The blade is generally not as thin: it can be up to 40 cm wide, whereas the blade of southern stiff-stiped kelp gets to only 25 cm. Its stipe isn't as stiff, and usually has a flattened section near the base of the blade. 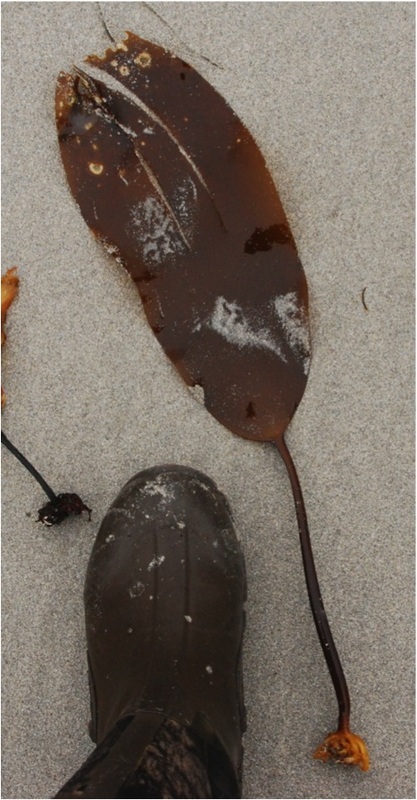 Southern stiff-stiped kelp can be aged like a tree. Concentric rings are visible when the stipe is cut into thin cross-sections, with each ring representing a year's growth. Find out more about this as well as other research into this species on the UBC Botany species page. Lindberg, M. and Lindstrom, S. (2010). Laminaria setchellii. Seaweeds of Alaska. Accessed 29/07/2014. O'Clair, R. and Lindstrom, S. Laminaria setchellii Silva. In Klinkenberg, Brian. (Ed.). E-Flora BC: Electronic Atlas of the Plants of British Columbia. Lab for Advanced Spatial Analysis, Department of Geography, University of British Columbia, Vancouver. Accessed 29/07/2014.